"The Dress" was perhaps the most viral image of 2015 - so why do the couple who took the picture, Paul Jinks and Cecilia Bleasdale, now have mixed feelings about their wildly popular photo? On the morning of 27 February this year, when I checked my mails, I was initially baffled by the sheer volume of interest from BBC colleagues about an optically curious image of a garment. I know now, though, that it wasn't just any morning. It was the morning of #TheDress. As you will probably remember, overnight, tens of millions of people had begun to discuss the colour of a dress - as seen in one particular online picture, it seemed to have almost magical qualities. Some saw it as blue and black, others as white and gold. And there seemed to be no convincing the other camp that they were wrong. We are not going to reproduce that image here - because, for reasons that will be revealed, that picture is now in legal dispute. It would later be argued that #TheDress and the different ways we see it have profound implications for science. But there's also a largely untold story here about the way the web works - what goes viral, and who gets left out in the process. Let's start with the story of how the picture was taken. Cecilia Bleasdale, a social worker, and her partner Paul Jinks, live in Lancashire. As 2015 began, Bleasdale's daughter was about to get married - so the mother of the bride was in need of something to wear to the wedding. "So we thought right, let's go dress shopping," recalls Paul. In one shop, they came across three dresses Bleasdale liked. "I asked a shop assistant would it be okay if I took some photographs of these three outfits to send to my daughter," she recalls. "And the third photograph that I sent was the one of the infamous dress." The dress was blue and black, so Bleasdale was surprised when her daughter texted the following back: "That's lovely mum. The gold and white one." To confuse matters further, Jinks, who was in the shop with her and had seen the original dress, also saw the picture as white and gold. The real colours of "The Dress" were finally settled for this one family on the day of the wedding, when Bleasdale - having bought the dress for £50 - wore it. 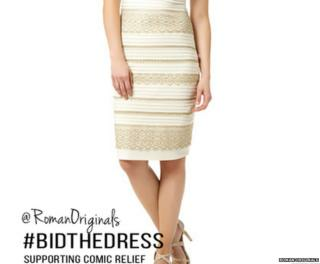 Everyone could see for themselves that the dress was black and blue. But that's real life. The internet is more complicated. Bleasdale didn't know it, but her daughter had shared that magic picture of the dress on Facebook. And one of her Facebook friends, the singer in the wedding band, was so fascinated that she then posted it on Tumblr. It wasn't exactly an organic hit - it only really spread after the website Buzzfeed noticed the Tumblr post and wrote their own story, with the picture included. (BBC Trending also published a story which originally included the same picture). The Buzzfeed story got 39 million hits. Barry Smith, a director of the Institute of Philosophy of the University in London, told BBC Trending that when it comes to optical illusions, "there has been nothing quite like this." Most visual illusions, like the one below, can be seen both ways by the same person. Image caption Is this image by Joseph Jastrow a rabbit or a duck? Not so #TheDress. "Instead we seem to find out that there was a very definite split in the population," says Smith. "Some people looked and it was white and gold, others looked and the dress was blue and black. How could it be that people with normal vision could divide into either of these two camps?" The answer to that is the idea of colour constancy - an effect whereby the brain is able to keep colours in the environment looking the same, even if the lights illuminating the environment change. "If you imagine your eyes and brain are like a camera, it might set to the setting of outdoor and then it processes the visual information in one way - or it might be set to indoor and then it processes information in a different way," explains Marie Rogers, who researches cognition and colour perception at the University of Sussex. The key to the secret is the burst of blue light that appears at the back of Cecilia Bleasdale's picture. It had the effect of making the dress - which is definitely blue and black in real life - appear white and gold to some people. It is the background lighting that made some brains - but not others - mentally adjust the colours they see on the dress in front. Within just hours of the Buzzfeed story appearing, Bleasdale's photo had spread around the world, and got scientists and philosophers talking. But for the couple themselves there's a melancholy side to the memory. "Well, we were completely left out from the story," said Paul Jinks. "It all happened so fast," adds Cecilia Bleasdale, "we had no control." The couple have now hired a solicitor and are considering taking legal action to protect their copyright in the picture. "You saw all the companies using the blue and black and white and gold to sell their products and nobody wanted to miss out," she recalls. Paul puts it more bluntly: "Basically they've taken our property and profited off it without even giving us a credit, a thank you, nothing." Hear more from the Trending team - on our podcast from the BBC World Service. The couple appeared on the Ellen DeGeneres programme in the US, but have done few UK interviews. "Part of me thinks, 'oh you know it'll always be a conversation piece for years and years after I'm gone,'" she says. "It would have been nice to have a bit more control, but it's easy enough to say that with hindsight." Buzzfeed say that a reader submitted the photo and that they "take the rights of intellectual property owners very seriously, and if there is any inadvertent issue or misuse, we will work swiftly to correct that." Paul and Cecilia's image was remarkable and unique. Perhaps if the internet didn't exist, or maybe if they themselves had just posted it online on a small personal site, it might still have become famous. But next time you see it, it might colour your perception to know that the people who brought #TheDress to public attention feel pretty mixed about its impact on their lives.